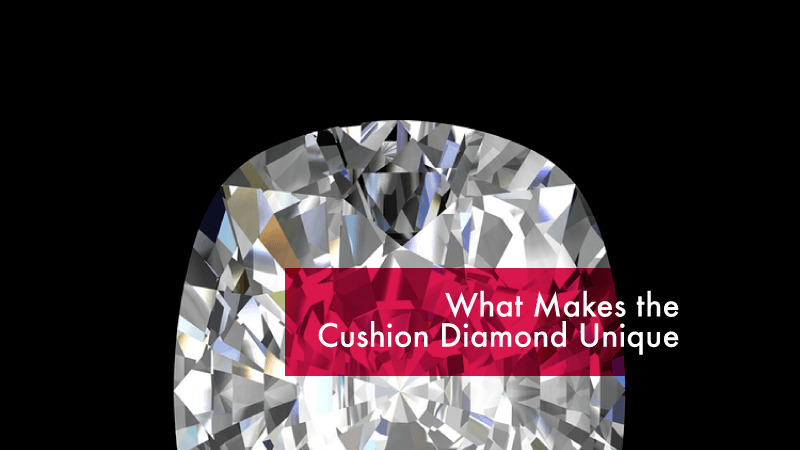 What Makes the Cushion Diamond Unique? Holding a crucial place in the history of diamonds and engagement rings, the cushion cut is one of the top three diamond cuts, following closely behind the round and princess cuts. The cushion cut features a diamond cut into a deep square or rectangular shape with rounded corners and sides, an open bottom, and large facets. Many actually consider the cushion cut the vintage version of the contemporary round cut. 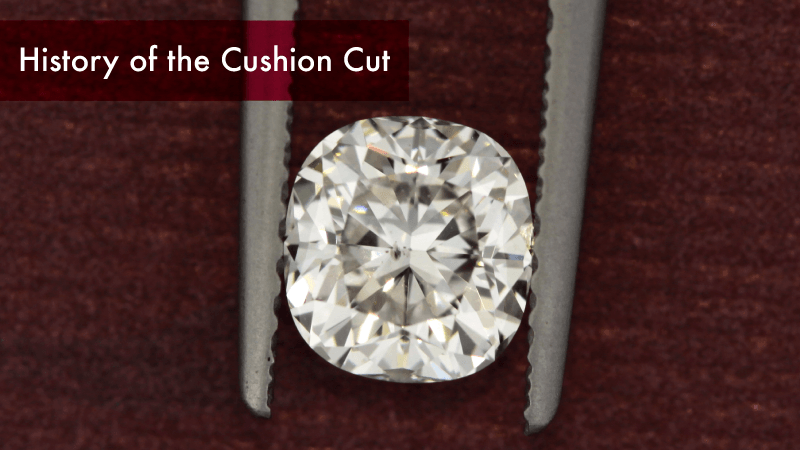 The cushion cut is also known as the “pillow” cut or “candlelight” cut, the latter referring to the fact that the cut is designed to reflect candlelight. Most modern rings are designed to reflect high energy, brighter light, while the cushion cut reflects a softer light distinctive to light sources from its heyday. This means it lacks the brilliance and fire of modern cuts, but alternatively, it offers a softer look that lends it a classic, romantic appeal and maximizes the stone’s luster. Though the cushion cut has existed for a few centuries, it has numerous contemporary variants. Marcel Tolkowsky introduced the new method of cutting cushions with brilliant facets; the same faceting technique as a modern round cut diamond. This technique adds more fire and brilliance, and is commonly referred to as a “cushion brilliant”. Occasionally, modern cutters will fashion cushion diamonds with an extra row of facets on the pavilion, or bottom, of the diamond. Cushions cut this way are generally referred to as a “modified cushion brilliant” on diamond grading reports. Adding a modern flair, they can sometimes look like crushed ice with an enhanced sparkle. More than any other diamond cut, the cushion cut allows for a large degree of variance in cutting style, making it the ideal choice for someone craving a completely unique look for their stone. Proportions can vary from rectangular to square and faceting patterns can vary widely. Though there are recommended ratios for the length and width of the cut, it is never more true that no two diamonds are the same than when comparing cushion cut stones. Though the cushion cut has recently come back in fashion as an alternative to oval and round cuts, it has actually been around since the nineteenth century. It is a descendant of the “old mine cut,” so-named for the diamond mines in Brazil. The old mine cut dates to the 1700s and was the most common cut until late 1800s. The old mine cut with its square shape, high crown, and small table was designed to accommodate most stones’ natural shape, while retaining the most weight upon cutting. The modern cushion cut most closely resembles a cross between the old mine cut and the oval cut shape. While the old mine cut has 58 facets, the cushion cut evolved to feature 68 facets to further enhance the diamond’s brilliance. Because of its weight retention, natural enhancement of the diamond crystal’s shape, and its reflection of candlelight, the cushion cut became the standard cut for diamonds beginning in the 1830s. The cut was so popular that the majority of all gemstones were cut in this shape, not just diamonds. Because the modern cushion cut has so much variance, some styles are referred to as the antique cushion cut to refer back to the style’s historical roots. Some of the most famous diamonds in the world feature a cushion cut. The Napoleon Diamond Necklace, a gift from Napoleon Bonaparte to his second wife, Empress Marie-Louise of the Habsburgs, features 263-carats of the cushion’s inspiration, old mine cut diamonds. It can now be viewed at the Smithsonian Museum of Natural History, alongside perhaps the most famous cushion cut diamond of all, the notorious Hope Diamond. This 45.52 carat blue diamond is believed to be cursed due to the unfortunate trail of intrigue and death it left in its wake across three continents. Other famous cushion cut diamonds include the Regent Diamond, once part of the French Crown Jewels (140.5 carats), and the Tiffany Yellow Diamond, which weighs a whopping 128.54 carats and was worn by Audrey Hepburn in promotional materials for Breakfast at Tiffany’s. The cushion cut has become a favorite for celebrity engagement rings, helping to precipitate its return to popularity. Former E! News anchor Giuliana Rancic and her husband Bill have one of the strongest marriages in Hollywood, and their love was sealed with a beautiful 4-carat cushion cut ring with a triple micropavé split shank band, lending it a vintage style. Rancic’s ring has a more square shape, which is accented with a diamond halo that enhances the natural softness of the cut. Though Miley Cyrus’ relationship with Liam Hemsworth has had more ups and downs than her musical persona (we’re still not even sure if they’re engaged or not), one constant has been her 3.5-carat cushion diamond that Hemsworth gave her on their first go-round. The ring had a noticeably classic flair, set in an 18-carat gold band with art nouveau flair. What’s more — the center stone is an antique itself, dating to the late 19th century. Jennifer Garner and Ben Affleck have called it quits after ten years of marriage, but her engagement ring drew almost as many heads as Affleck’s previous engagement ring to Jennifer Lopez. The 4.5-carat cushion cut made the centerpiece of a traditional Harry Winston three stone platinum platinum setting, and its longer, more rectangular shape flattered Garner’s fingers. Former Destiny’s Child member Kelly Rowland may not have the solo career of Beyoncé, but her engagement ring certainly gives Queen Bey’s a run for its money. The 4-carat cushion cut ring from former manager Tim Witherspoon features a halo setting with pavé band, a design that quickly had other brides-to-be hankering after it. Because the cushion cut can come in a variety of shapes and sizes, it can shine in any number of settings. The cushion cut also retains its natural color better than many other diamond cuts, so it’s a perfect choice if you’re hoping for a pink, yellow, or any other colored diamond. 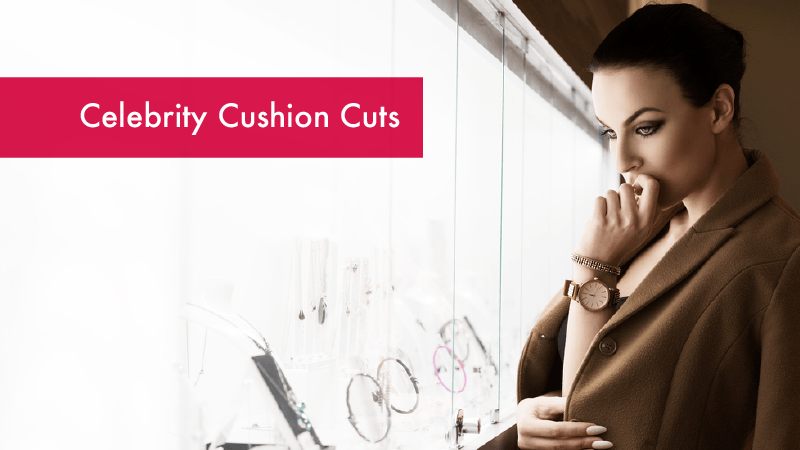 Cushion cuts are defined by their sleek, symmetrical lines and their soft, romantic light performance. This means that the cut lends itself to both modern and vintage settings alike. 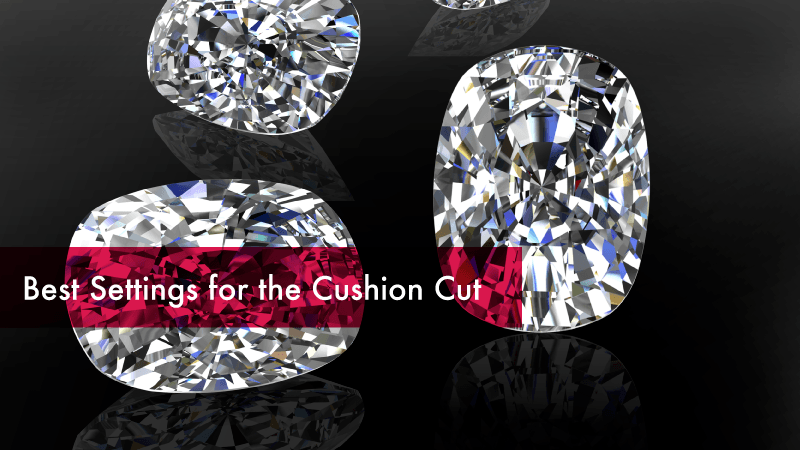 One thing to keep in mind though is that the variance in cut can affect the strength of the stone’s girdle, so while the girdle may not be as important to other diamond cuts, you should pay a little more attention when shopping for a cushion cut stone. If you have a larger stone, particularly if you’re keen to show off your unique cut, a solitaire setting will give your cushion cut center stone the effortlessly elegant and modern look you crave. If you want a bit more of a vintage feel, try the floral Ivy or era-inspired Edwardian band with your cushion diamond. Halo settings are also a popular choice for cushion cuts because their rounded edges lend themselves beautifully to the diamond-encrusted border of the halo. Options range from a halo on a plain band to a halo on a split shank band to the ultimate in sparkle halo on a pave band. Finally, cushion cuts are also a favorite for those designing a setting with side stones, as their symmetrical design and rounded edges complement other stones nicely. From three stone designs featuring a different cut to an entire band encrusted with stones to a center stone with several stones flanking it, the cushion cut is a versatile design for pairing the center diamond with other stones. Cushion cuts once dominated the diamond industry, and they are experiencing a return to prominence. In 2003, Tiffany and Co. listed the cut as one of the five most iconic engagement ring styles. Without question, this classic, which has once again become a contemporary favorite, goes to show how much a diamond truly can be forever.